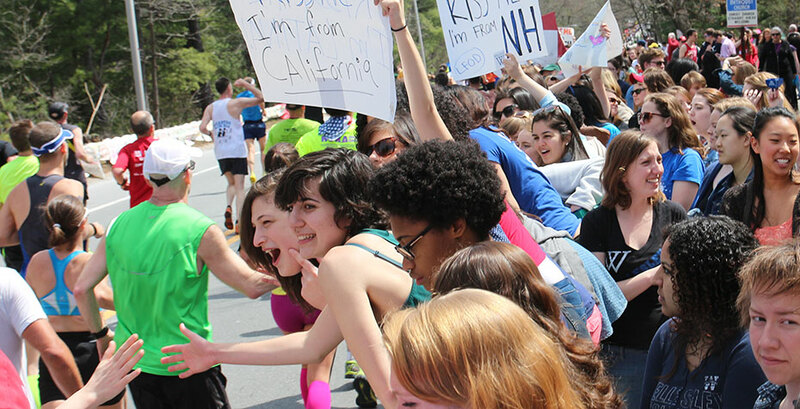 Wellesley joined the spirit of making the 2014 Boston Marathon not just a race but a joyous show of fearlessness and strength. Students were determined to make the already famous Scream Tunnel the biggest, loudest, longest one to date (as Sports Illustrated and others recounted). While such a thing may be hard to quantify without a decibel meter on hand, they surely succeeded: A Boston Globe video quotes two different runners saying Wellesley was the loudest ever; and the answer to the Boston Marathon Facebook page’s annual question of which section of the marathon was the loudest was... Wellesley. The crew of students in Munger creating custom signs requested by runners and supporters took more than 800 sign requests this year--triple the number from last year. Alumnae were encouraged to return to Wellesley for the day, and the campus BBQ attendance was also at a record high. And there was much more coverage of the race that gave Wellesley passing shout-outs as well. With more on radio and television. So... until next year!